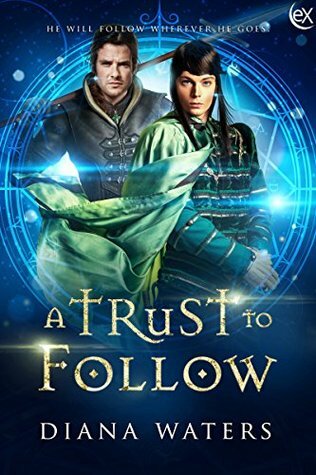 Daymon is the second prince of a kingdom in which Evokers—those who possess intuitive magical abilities—have long since been treated with fear and mistrust. Marked as an Evoker himself, Daymon is captured by those who wish to take advantage of these powers. Now, the prince must put his faith in Rhyder, the captain of his guards—and the man Daymon has claimed as his own—to free him. Thinking about my rating and review for A Trust to Follow had me spinning around in circles. I liked it, really liked it and yet I felt like I was dropped in the middle of a story and what I really wanted was like a dangled carrot I could never quite reach. Prince Daymon and the Captain of his guard, Rhyder are long time lovers. Prince Daymon claimed him for himself and they spend their days trying to change the prejudice and fear surrounding those with magical abilities (Evokers). Prince Daymon is an Evoker and gets into many dicey situations trying to change perceptions and thwart harmful acts against other Evokers. This lands him in trouble as he tries to save a fellow mage from an attack and gets himself captured. We follow along in Daymon’s mind as he lives through his captivity and the enormous faith he has in Captain Rhyder. As I mentioned above, I liked it. The writing kept me connected, the ‘story’ was interesting, and at the same time I wanted more. This seemed more like an extended scene rather than a full story. I want the story of how Daymon and Rhyder met, became friends, allies, and then eventual lovers. I want the parts of them fighting off evil acts to make a better name for Evokers as they fall in love. Instead, we are dropped in when there was already a claiming, most of the scene/story they are separated, and we are provided very little flashbacks on how they came to be. I’m not sure if this should be the start to a series but it does a decent job of explaining Evokers and the trials they face to make it in a world that’s set to hate them for merely existing. I think if Daymon and Rhyder got their story, this would be a nice bonus addition. Still, it worked in its own way. Recommended. Copy provided by author in exchange for honest review. Previous postBlessed by Maggie Blackbird is out Now!